Ruth Keitz’s shifts from flat space to illusion and actual space is masterful as demonstrated in her show, “View / No View,” at the D’Arte Centre Gallery in Harlingen. She presents witty works that appear to be flat renderings of 3-dimensional spaces, but are not actually flat. Found objects mingle with graphite lines and watercolor washes. “View / No View” is all about spaces and rooms. The artist’s former classrooms, views from her studio, views of a room in what was once her sister’s home and spaces and structures from her childhood home all find a place in these works. Most typically, a direct view of a wall with a window/door bounded by a perspective view of its adjacent walls is featured. What makes these images interesting is the use of business envelopes and other found materials that adapt so well that they may be overlooked. Window envelopes become doors with windows and cat whiskers become pulls for window shades. 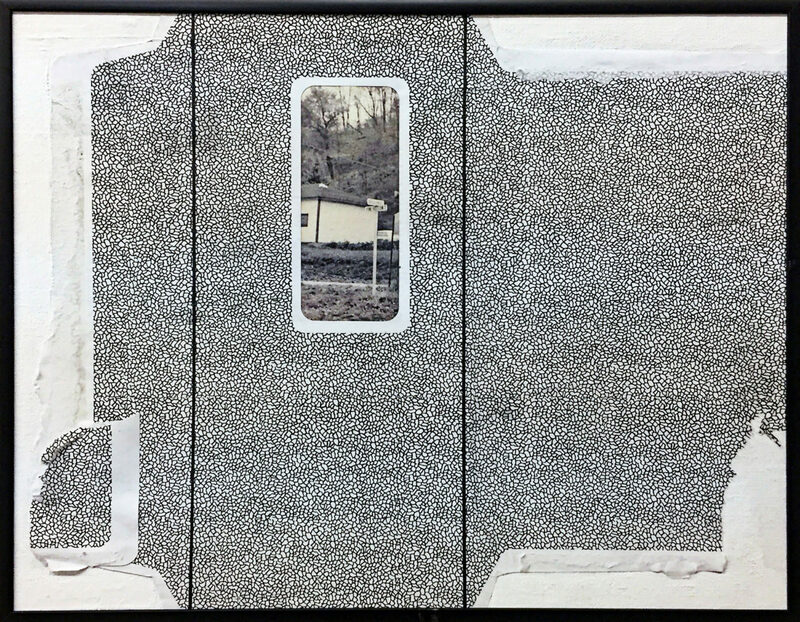 Whiskers appear as window shade pulls in “G-115 Classroom.” This first work tells us that Keitz is going to play a game of mental perception with us in these misleadingly simple and direct images. With this triptych — a picture on three panels — she has deconstructed her gaze through the classroom door window — representing views through the window of the classroom door across the hall, through the window of another classroom door and through the window of that classroom to the outside. Classroom teachers can probably best relate to this. Renaissance perspective is also a major player here, along with the Renaissance concept of the painting being the window to the painted image. The envelope window becomes a conveyor of questionable meaning within this concept. With “Outside View In,” the envelope becomes a door and its window becomes a classroom-door window. 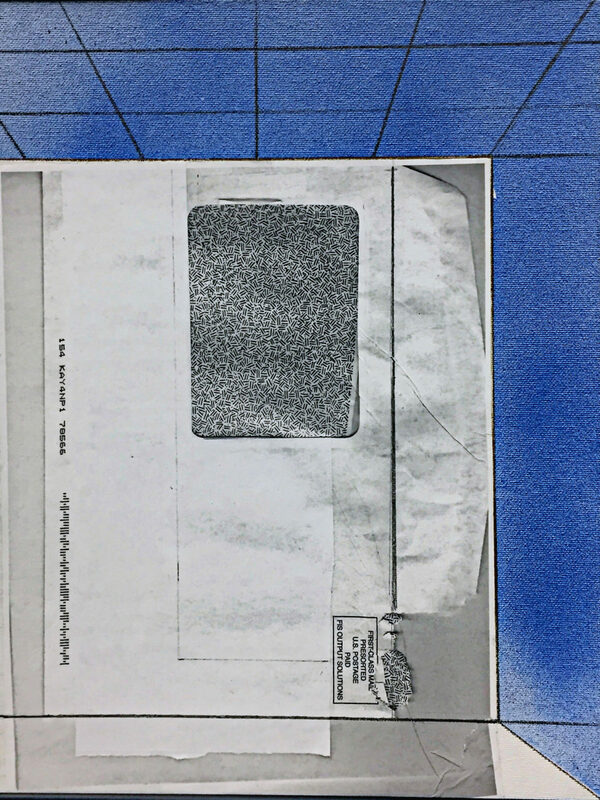 Although it is shown as an indoor scene, we see the outside of the envelope with its window showing the inside. To mess with our minds further, Keitz twists a familiar philosophical question into “An empty room may have a window, but if no one is in the room, is there a view?” Keitz also leads us into other optical conundrums. Here and elsewhere the linear perspective is often distorted. “Inside Out: A Window/Door to the Past” tears open the envelope, which creates an illogical perspective, allowing the window to become a vision of memory. Other works, while still maintaining the intellectual basis of formal art investigation, incorporate autobiographical remembrances. For example,“1601 Pine Hollow Road: Through a Glary, Blurry Window Triptych: My Mother, My Sister, and Shortie” looks back upon rooms and spaces that shaped the artist and how memory reshapes the past. The work “28 Harrison Ave: Theo Waiting by L’s Empty Chair” is the most acutely moving of the group. 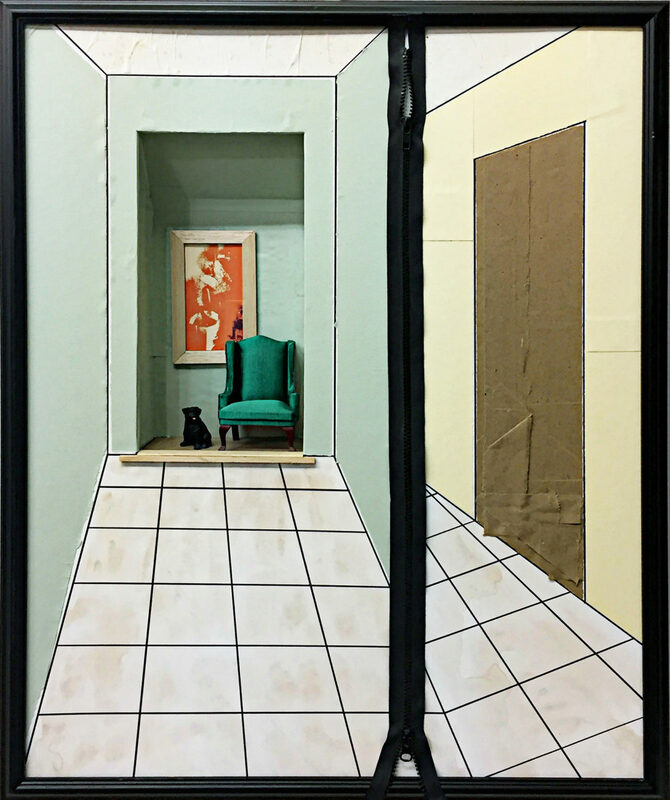 Remembering the rooms of her sister’s home, now silent and empty, she offers two poignant views; in one, a 3-D room holding a remembered presence is constructed within the 2-D window/door frame, and the other offers a flat non-existence of skewed dimensions. The display is congested, but all of these works deserve a careful gaze. Guideline information is posted for each set. In “View / No View,” Keitz has deconstructed her mental perception of memories for us.